It is nice to be reminded about how well the past year has gone and what a great journey it has been and it wouldn't have happened without a lot of support. I would like to give special mention to Sheila Newman, Jill Quirk, the candobetter.net website and all the folk at the permaculture village at Confest (which is where I held my first workshop during Easter last year). I would also like to thank Michael Bayliss for his unwavering support. Connecting with these people and others has been invaluable in terms of helping to build the Population Permaculture and Planning movement that began with that first workshop. One of the reasons why I have managed to engage with so many people since then is because I have tried to take a more collaborative approach with no fixed outcome and with no expectations other than a passion to make real change....so far it seems to be working and I will discuss more about that as we go on. Working in collaboration with people can take you to places where you never expect to go and I mean this in a good way. It can be very constructive if you get it right. You can help to bring the best out in people and they can help to bring the best out in you but if you get it wrong it can have the opposite effect. I have been involved in activism to a greater or lesser degree for quite a number of years and I have seen a lot of activists come and go along the way. Many have burnt out, many became disillusioned and overall, despite our best efforts and some great wins along the way, the trajectory in terms of making the world a more ecologically and socially sustainable place has generally been downwards......which is quite depressing. Part of the reason for this is because people have a tendency to bring their agendas and egos into movements. After a while it becomes all about protecting identities and valuable energy that should have been used to create systemic change is wasted in internal fighting. I am sure that you can all relate to this to a greater or lesser degree. For example I have seen animosity between vegans and non-vegans in the animal welfare movement to the point where I sometimes wonder whether the animals would have been better off had we all just gone home and watched TV. So over time I have learnt that creating real proper decent long-term change requires more than going out and fighting the good fight so to speak. There is also a need to create underlying whole-scale cultural change from within. A great philosopher once said that you cannot overcome an addiction with the same mindset that allowed that addiction to manifest in the first place. If we want to lift ourselves out of the very real climate emergency that we are currently facing and achieve so much more, we have to change the record; we have to re-examine our approach so that we can achieve real progress with our activism as well as ensuring that what we achieve is effective and durable. This was my intent when I started Population Permaculture and Planning or PPP as I shall refer to it from now on. For a start...... the fact that I was taking on the issue of population knowing very well how divisive and emotionally fraught this topic can be, I realised that I had to approach it in a way that could make it as accessible to as many people as possible. I started PPP in part because I could no longer ignore the population issue, especially knowing the impact that it has in terms of how we plan our cities (or not plan as the case may be). I had entered into the town planning profession because I thought that was the best that I could do in terms of contributing towards making the world a better place. Basically I thought that I could change things from within. Obviously I was a bit naïve but it was worth studying planning because while my education didn't turn out to be of much use to me in a professional context, it did teach me to think critically and to understand that many issues are often more complex than they first appear. Ignoring this complexity can lead us into all kinds of problems. So because my drive as a planner was to try and create sustainable communities, it became increasingly apparent that we cannot ignore the topic of population growth. With Melbourne increasing in size by more than a thousand people every week, it is becomes impossible to engage in the slower more considered planning that is needed to create long term viable neighbourhoods. It is a case of more hastily built prefab concrete apartments and continuous sprawl beyond the urban fringe. This rapid rate of population growth of course is used to justify this type of development and this type of development is in turn perpetuated by politically engineered population growth. It is a vicious circle spinning perpetually downwards as our potential to create socially and ecologically sustainable communities continues to decrease. What makes this fact all the more poignant is that there is an urgent need to rapidly reduce our carbon emissions and it is imperative that this starts with town planning. If we get this wrong everything is so much harder, no amount of divestment from fossil fuels will be of help if we continue to build on our food bowls and green spaces and increasingly have to rely upon sourcing our food from further and further away... and that is just the start. Creating resilient communities is about being flexible and adaptable to changes in society that we cannot even perceive at this point in time and we are living in extremely uncertain times. It may just be that we will come to value the larger middle suburbs that are currently targeted for subdivision and that we will look towards retrofitting them as permaculture communities. There is good soil out there that has been lovingly enriched over the decades by generations of Greek and Italian migrants and we have the infrastructure already in place to produce a good proportion of our fresh fruit and vegetables from this under-tapped resource. The cofounder of Permaculture, David Holmgren, has a new book coming out later this year that is about all of that....... but I am digressing. So I came to realise the important interconnection of permaculture and town planning and population in terms of creating long term viable sustainable communities and that by discussing the three in context I could make the issue of population so much more approachable to so many more people. This inspired me to start running workshops and by doing so I began to draw people in who otherwise may not have been interested in discussing population as a subject in its own right. Importantly this had to be a collaborative effort. When we engage with people about population or indeed any other subject for that matter we must try to connect with their world view, to see it from the prism of their perspective and use that as a starting point. I always begin by brainstorming ideas with the participants at the beginning of each workshop and that way they are better able to feel as though they are part of the creative process and to share some of the ownership of the outcome. It is not a case of me lecturing to people how they should view a particular topic. Instead it is a step by step process and this always leads to an understanding that our current rate of population growth is something that has to be questioned. I am not saying that everyone comes out of the workshop agreeing that there is an urgent need to reduce population growth but almost all come out knowing that population is an important consideration and that it is ok to discuss it, especially when looking at its importance in a wider context. This means that the next time they hear the population issue brought up in discussion, they will be more open minded. This is why I believe it is important that we help people to think about population without challenging their values or their political identity. Some people come into a workshop believing in the principle of open borders for example and they come out continuing to believe in that principle. However they also come out agreeing that in the mean time we need to slow our rate of non-refugee migration so that the communities we do create are socially and environmentally viable over the longer term. They no longer see population as a fixed black and white issue, that it is in fact fluid depending upon the circumstances. A belief in the free movement of people is strong among many young people on the left and if we want to connect with them we must acknowledge these ideals and by doing so they will more likely acknowledge that there are many steps that need to be undertaken before that kind of thinking can be put into practice. There may come a day when the world is so balanced politically, socially and environmentally that we could have open borders across the world without it leading to sudden influxes of population from one country to another. It doesn't look very feasible at the moment but who is to say that we shouldn't work towards that ideal. It is an ideal that I would like to work towards no matter how out of reach it may feel. We don't have to smash people's dreams in order to persuade them to consider reversing a migration policy that was put in place by John Howard in order to boost gross domestic product. 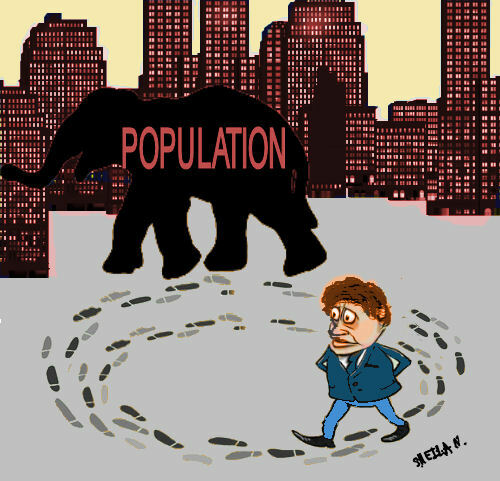 We need to slow the rate of population growth as it is right now and, for want of a better word, start an intelligent and ongoing national conversation about the rate in which our population should grow (or shrink) and how we should plan for that to happen. Right now that is all we need to be trying to achieve. As population activists, we ourselves need to acknowledge that we all have differing values and that we should be comfortable with the fact that we do not all need to share the same values in order to bring about change. The important aim of the workshops that I hold is that they do not run to a particular agenda other than to help people connect to the three issues of population, permaculture and planning. This attitude I think needs to form a wider approach in terms of how we work with other activists, that we work towards finding those areas where we can connect and that in turn allows us to feel comfortable with different values and perspectives. We need to see our work as being part of an ongoing conversation that will always be greater than the sum of one person's perspective. That way we don't get bogged down in internal politics and because our agenda is fluid, our values do not become threatened. In turn, by taking this approach we can have a profound influence on the people with whom we interact. They pick up on this sentiment and they themselves become more open-minded and become more open to challenging assumptions as well as seeing things from other perspectives. We need to work together to find areas where we can connect rather than focussing on the games of ego that occur through issues that divide us. That is what got us into this mess. We need a different kind of thinking to let us get out of the mess and to stay out of it. So when discussing population, let your starting point be about finding the issues that you have in common. It could be about congestion, climate change, loss of heritage, the list goes on. It is not about us pushing our view of the world onto people. Instead it is about helping them to see population in a new light by showing how it connects to the issues that are important to them. This is the kind of thinking we need in order to create a truly sustainable and resilient world. We need to think outside the matrix and to help others do the same. An extreme heatwave and drought in East Asia is now sparking extraordinarily large wildfires in mostly unsettled regions of Northeast China near the Russian border. The massive fires are plainly visible in the LANCE-MODIS satellite shot and include at least four contiguous fire zones. The fires each show very large burn scars with fire-fronts ranging from 10 to 40 miles across. In essence, what this satellite shot is showing are 3-4 Rhode Island size infernos. A very large smoke plume cast off from these blazes is now visible in the MODIS satellite shot. It stretches away from the massive burn scars and on out into the Sea of Japan nearly 1,000 miles away. By comparison, the Northeastern China fires together now dwarf the recent massive blaze that burned 2,400 structures in the Canadian town of Fort McMurray over the past week. Yet another instance of extraordinarily large fires burning in a world forced to warm by human fossil fuel emissions.